A magnesium sulphate heptahydrate, a fully soluble fertiliser containing magnesium and sulphur recommended for vegetables, fruits, flowers, turf, vines and ornamentals grown in soil and soilless culture. 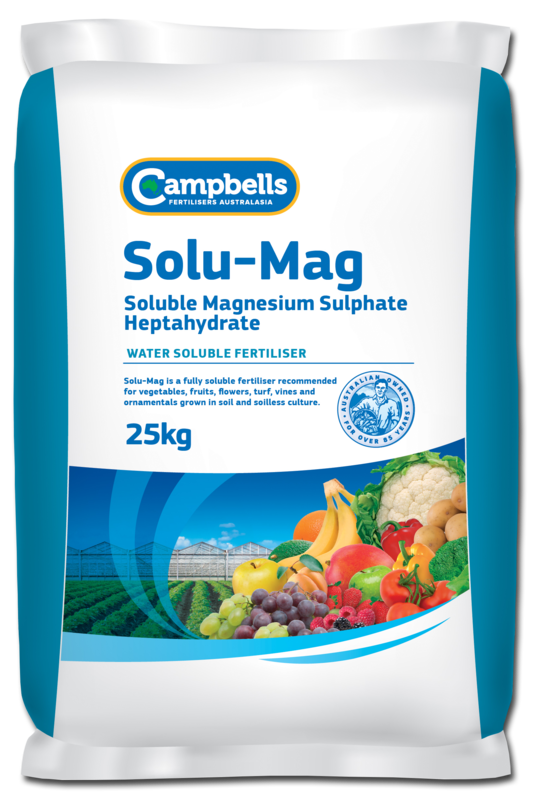 Campbells Solu-Mag is a fully water soluble, chloride free fertiliser containing magnesium and sulphur nutrition for consistent growth responses on a range of plants. Magnesium play a central role in the formation of the chlorophyll molecule. Chlorophyll gives plants the green colour and allows plants to photosynthesise. A lack of magnesium can reduce the amount of green pigmentation and reduce photosynthesis. Campbells Solu-Mag is suitable where magnesium requirement is high and supply is lacking. Solu-Mag is for application via irrigation systems (fertigation) in soil grown and hydroponic crops. It dissolves rapidly and completely and remains in solution ready for root adsorption or is taken in via leaf surfaces. General fertigation rates for horticultural crops are between 20 to 40 kg/ha. When applying Solu-Mag through the irrigation system more frequent and smaller applications guarantee the nutrients are supplied to the plants without being lost due leaching or excessive rainfall. The actual rates, number of applications and their timing will vary considerably for different crops and for different districts. Before application, seek advice from your Campbell’s Solu-Mag distributor or your local agronomist.